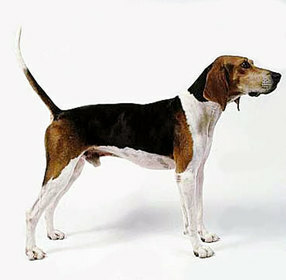 The Treeing Walker Coonhound developed in United States in 1800. They were used as a hunting dog and were champion in their field. Due to their ability of climbing on a tree, they are a favorite amongst the walking hunters. This breed is very powerful; possess stamina, speed and bravery. Moreover, they have a tendency to run behind moving objects. They can hunt in any area and in every climate. This breed of dog is very loyal to their master. They seek their master’s attention and can become destructive if they are left alone for some time. This breed of dog has single coat which is short, smooth, fine and glossy. The coat is black, white, and tan, and may be bi-colored or tri-colored. Breeders and show registries typically prefer the tri-color variation. This breed is a heavy shedder. The Treeing Walker is a good learner and learns quickly. The training should be given with fairness and patience as they will not respond to hard and harsh methods of training. This breed is very energetic and it is important to give them consistent exercise. They love to go for a walk and enjoy family play sessions. They are not recommended for apartments and do well in rural settings. This breed of dog requires occasional brushing to prevent them from dirt and bathing should only be done when needed. It is important to regularly check their ears to avoid any infection. It is a relatively healthy breed with no known health diseases. They may live up to 12-13 years.